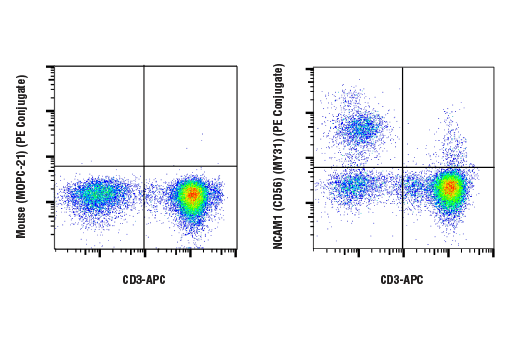 Flow cytometric analysis of live human peripheral blood mononuclear cells using NCAM1 (CD56) (MY31) Mouse mAb (PE Conjugate) and co-stained with CD3 (UCHT1) Mouse mAb (APC Conjugate) #19881 (right), compared to concentration-matched Mouse (MOPC-21) mAb IgG1 Isotype Control (PE Conjugate) #63630 (left). NCAM1 (CD56) (MY31) Mouse mAb (PE Conjugate) recognizes endogenous levels of total NCAM1 (CD56) protein. This antibody detects an epitope within the extracellular domain.